Subscribe to our email newsletter to receive new address. Designed to free the world, the 1919-A4 is available to those who still are. The Browning Model 1919 was the work horse of the U.S. and allied armies. They were used in aircraft, tanks and front line infantry and saw action from WWII through Vietnam. OWN A PIECE OF U.S. HISTORY! You will find the detailed workmanship of this remanufactured weapon to be very close to the original and is excellent for shooters, re-enactors or military vehicle enthusiasts. Fires commercial ammunition or blanks. All components internal and external are finished with a gray military type parkerization process. The tripod is finished in current milspec coating. For a limited time we will be offering this semi-auto 1919-A4 chambered in .30-06 with a M2 tripod, 250 links, a training manual and BATF approval letter! PRICE ON REQUEST. All firearms sold with a manufacturer's one year parts and workmanship warranty. Don't miss the chance to own the legend - without all of the full auto hassles! This Firearm Will Shoot Semi Auto Only And Cannot Be Converted To Full Auto. Where 50 Caliber Rifles Are Legal. 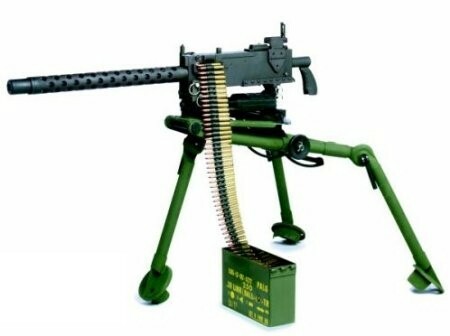 Check out the M2-HB 50 Caliber Belt-fed Rifle!